Integrated geophysical surveys using vertical electrical sounding (VES), very low frequency (VLF) EM, radiation counting, total magnetic field and self-potential (SP) measurements are carried out to characterize the geothermal area around a hot spring in the Nayagarh district, Orissa, India that lies in the East Indian geothermal province. The study was performed to delineate the fracture pattern, contaminated groundwater movement and possible heating source. VES interpretations suggest a three- to four-layer structure in the area. Resistivity survey near the hot spring suggests that weathered and fractured formations constitute the main aquifer system and extend to 60 m depth. Current flow measured at various electrode separations normalized by the applied voltage suggests that fractures extend to a greater depth. Detailed VLF study shows that fractures extend beyond 70 m depth. VLF anomaly has also very good correlation with the total magnetic field measured along the same profiles. 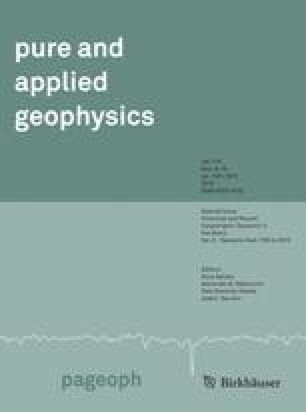 Study results suggest that a gridded pattern of VLF survey could map the underground conductive fracture zones that can identify the movement of contaminated groundwater flow. Therefore, precautionary measures can be taken to check further contamination by delineating subsurface conducting structures. Self potential (SP) measured over the hot spring does not show a large anomaly in favor of the presence of a sulphide mineral body. A small positive (5–15mV) SP anomaly is measured which may be streaming potential due to subsurface fluid flow. A high radiation is measured about four kilometers from the hot spring, suggesting possible radiogenic heating. However, the exact nature of the heating source and its depth is not known in the area. Deep resistivity followed by a magneto-telluric survey could reveal the deeper structures.